Dr Zimmerman’s Tuesday Tip — The ONE question that everybody asks. The ONE answer that gets people to do what you want. Everybody in the world asks the same question. All executives, all managers, supervisors and coworkers. Even all spouses, partners and parents ask the same question. So what’s the question? If you don’t know, you’re in trouble. And if you don’t know the answer to the question, you are having a lot more stress, anger, anxiety, frustration, and disappointment than you need to have at work and at home. And you’re getting a lot less engagement from the people around you. The question is … How do I get people to do what I want them to do? At my onsite keynote, half, and full-day programs and at my two-day Journey-to-the-Extraordinary experience, every day at least one person, and sometimes several people, pull me aside for one-on-one coaching. And they all ask me the same question. You get the point. Like everyone else, you also want to know how to get people to do what you want them to do. You could sit down right now and write out six or seven things you want your spouse to do. And you could write out another list that applies to your kids, your relatives, your coworkers, your customers, and everyone else you encounter. Notice my emphasis on the word “I.” Because if you don’t know the right question, you’ll focus on what’s wrong with the other person instead of what YOU can do about it. Once you know the question, you’ve got to know the right answer. Here it is. ► 2. The super powered ANSWER that gets people to do what you want them to do. Chances are you’ve heard that answer or some variation of that answer before. And chances are you’ve dismissed that answer as somewhat of a cliché. And chances are you’ve never fully implemented that answer into every part of your life, work, and relationships. In other words, how much you give … and how well your giving matches the needs of the other person … will determine how much cooperation you get back. (To register for my Chicago Journey on October 25-26, 2018 and receive a $600 tuition scholarship if you register by July 31st, click here. 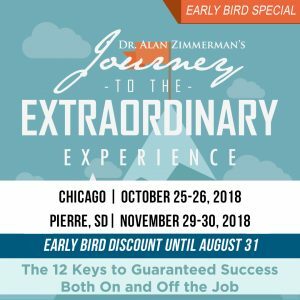 Pam insert hot link To register for my Pierre, SD Journey on November 29-30, 2018 and save $600, click here. The entire second day of my Journey program is focused on the 6 Keys to Positive, Productive Relationships. In other words, how to get people to do what you want them to do. Of course, I can’t share all those techniques here in a few hundred words, but here’s one tip to get you started. Come back next Tuesday for Part 2 of this article. ► 3. Treat everybody like a customer. Even though I “learned” this concept intellectually years ago, I wasn’t always practicing the technique. It took my wife to bring it home for me. Then it hit me. I would never tell my customer I would call them back and then fail to do so. I would never put my customer on hold for a few hours or a few days until I got all my work done. I would never sort-of listen to my customer as I was reading my email. But that’s exactly what I was doing to my wife. Fortunately, I wised up. I learned to not only treat my wife as a customer, but also make sure she was my #1 customer. And as you can imagine, the results are nothing short of a healthy, happy, and exciting relationship. Dr. Zimmerman’s Tuesday Tip, Issue 943 – The ONE question that everybody asks. The ONE answer that gets people to do what you want.